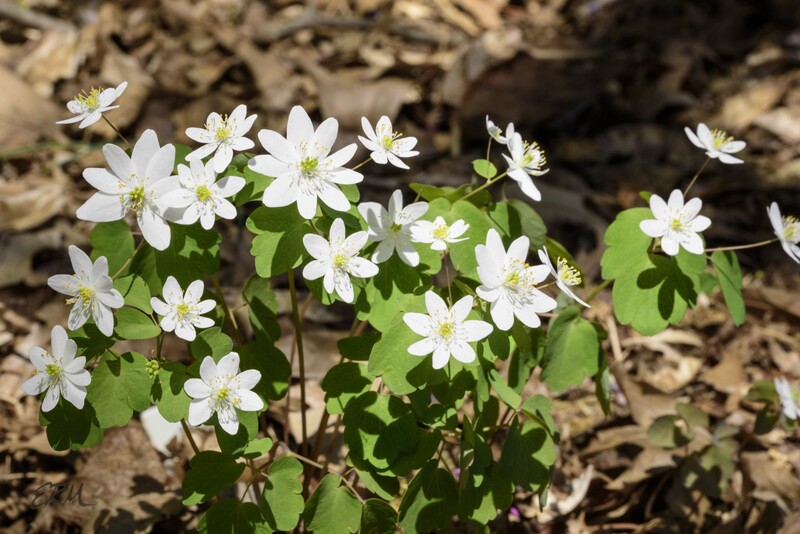 Some of our spring ephemerals are large and showy, like Virginia bluebells. 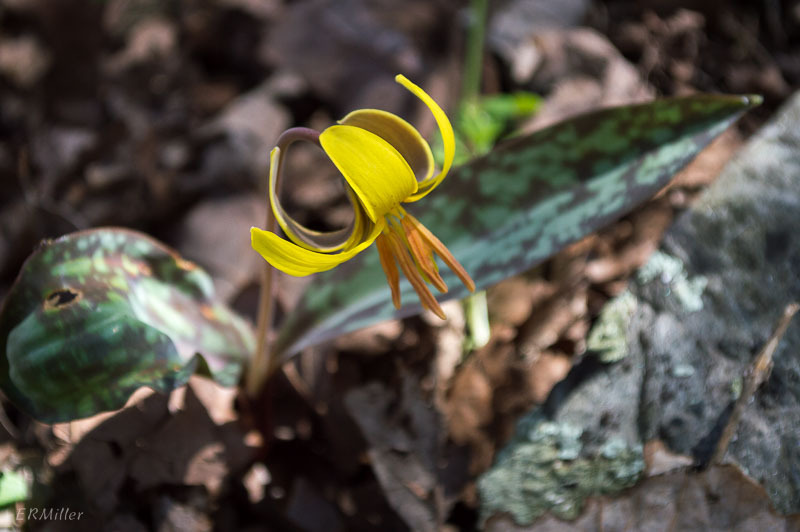 Some are smaller yet also showy, like trout lily. But many are quite small, and not showy at all, unless you see them up close and en masse. 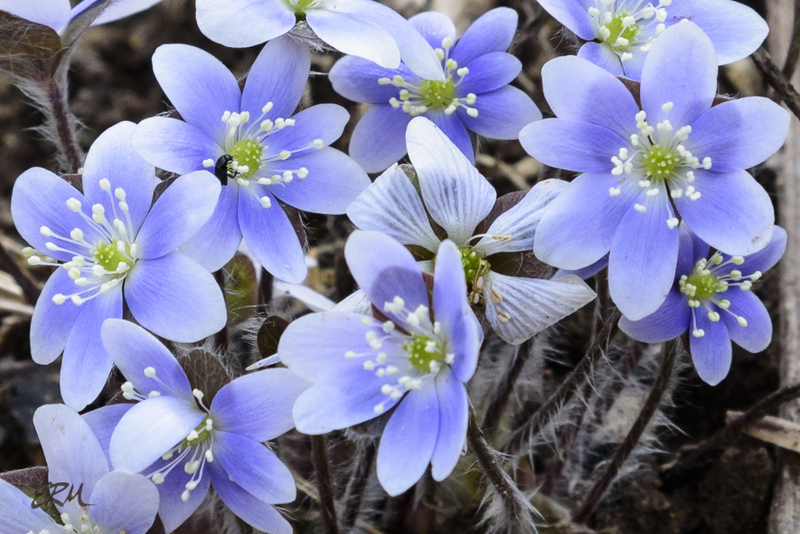 That’s the case with round-lobe hepatica (Anemone americana, formerly Hepatica nobilis var. obtusa; Ranunculaceae). 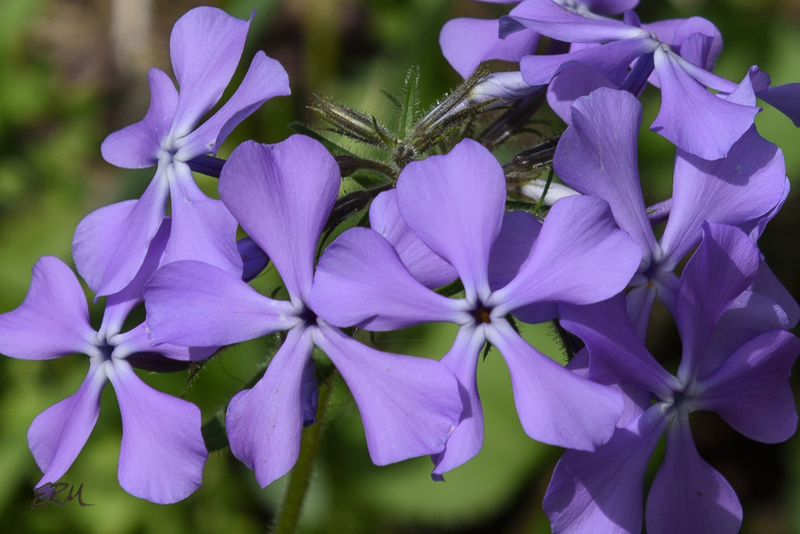 Last Thursday, I walked over to the area where I photographed a single clump of these flowers a month ago. All by themselves like this, they really stand out. That’s not usually the case, though. 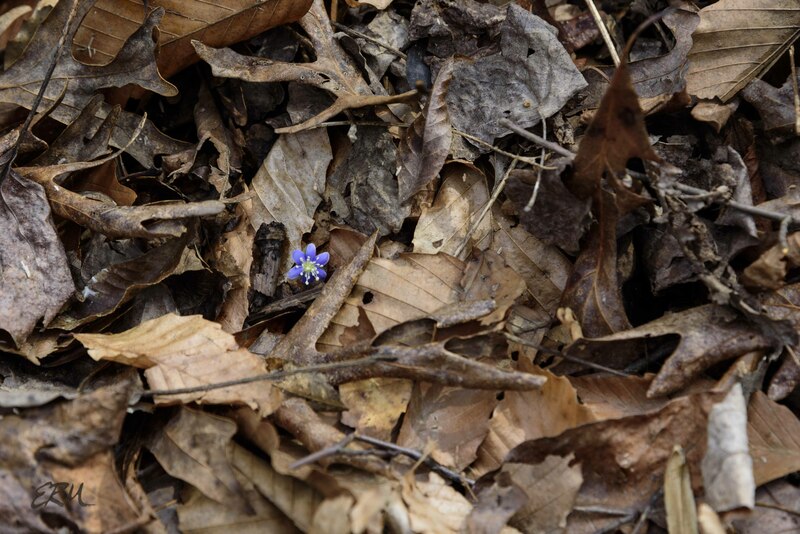 These little charmers love to hide in the leaf litter. I’d heard rumors that there were more to be found in that area, so I spent a long time walking slowly and looking for anything colorful. 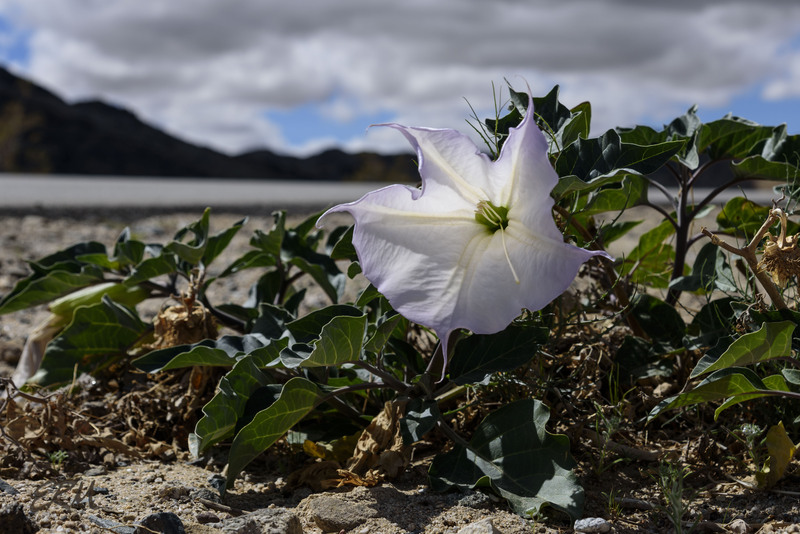 As my eyes acclimated I started seeing them – first one, then another and another. 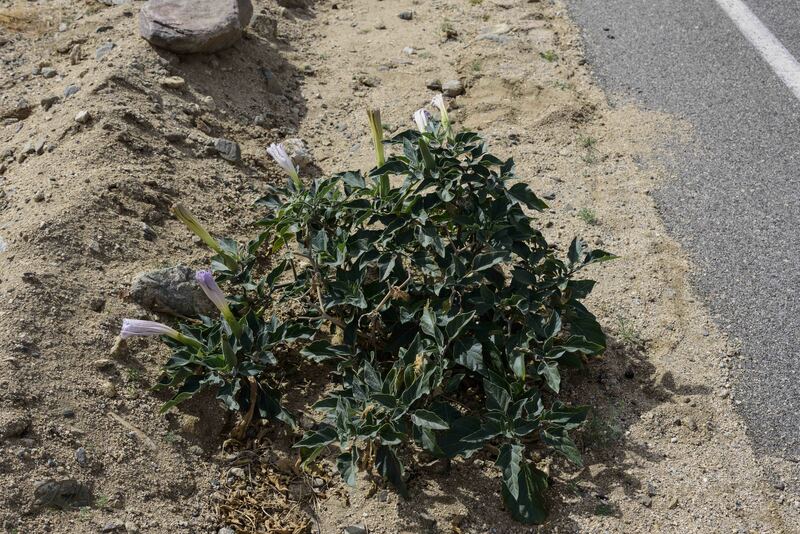 In an area where I thought there was only one plant, there were a dozen. Check out the variation in color. I did minimal processing of these photos in order to preserve the range of color, from dark blue to pure white. All these plants were putting up just a few flowers. The clump pictured in the first three photos is unusually large and robust, and showier since it’s growing in an open area. 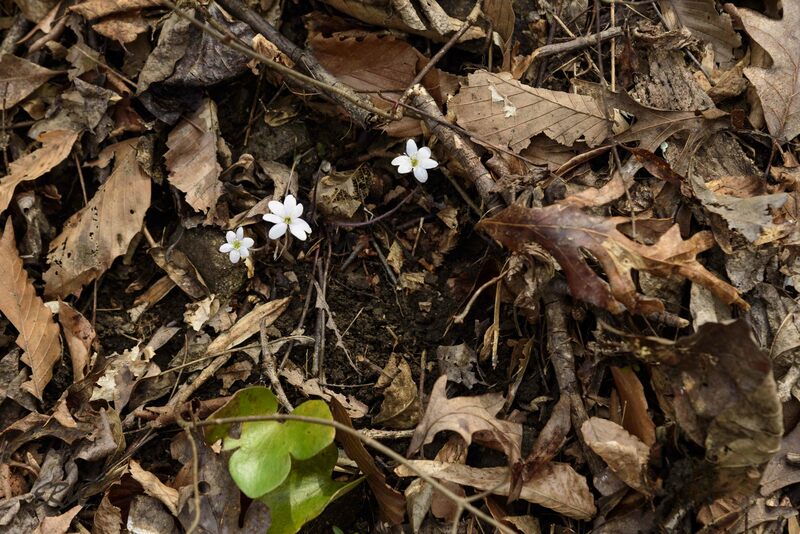 In this photo to the right you can see a few leaves below the white blossoms. 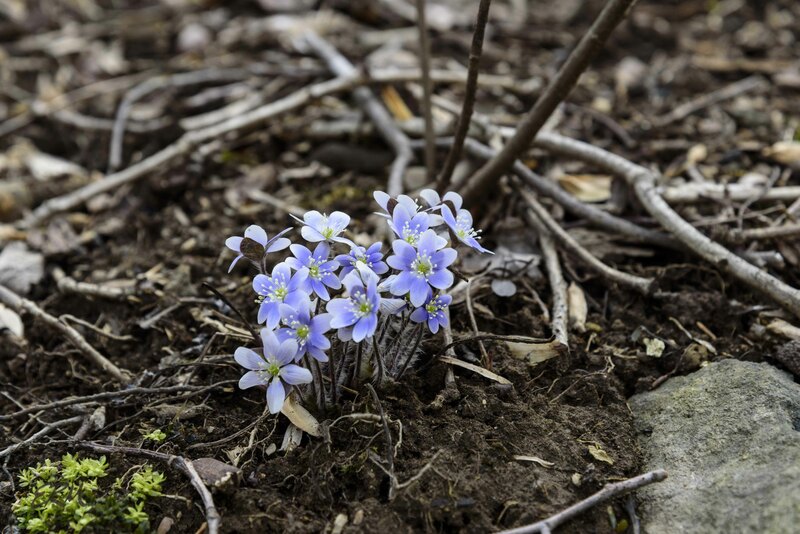 Round-lobe hepatica is hibernal, meaning the leaves grow in the summer and stay through autumn and winter, dying back in the spring as the plant blooms. 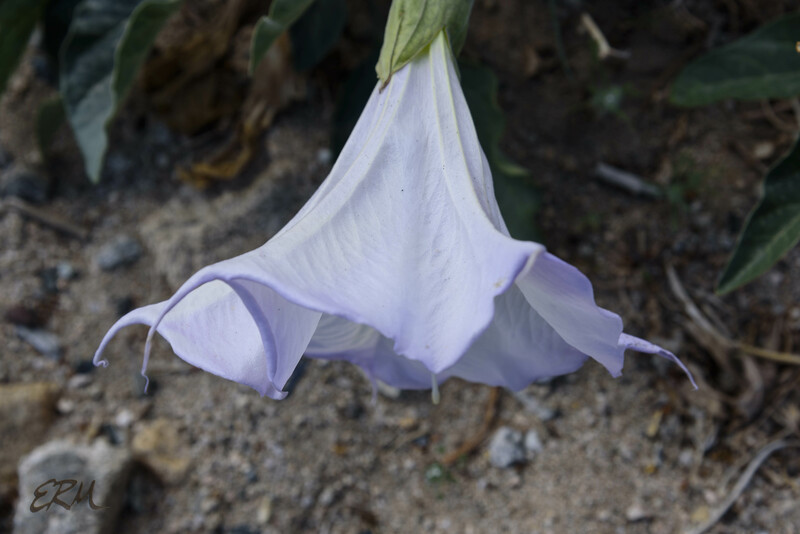 The flowers pictured below are a very pale blue. I went scouting on the Billy Goat C Trail Monday. Harbinger -of-spring is still blooming. More spring beauties are blooming. Just a few Dutchman’s breeches are open. And just a few golden ragwort. 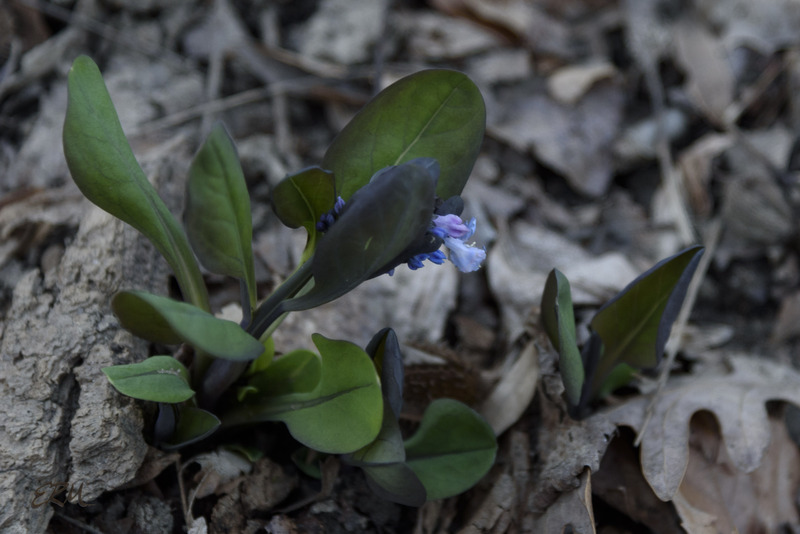 Virginia bluebells are budding up nicely. A few more days of warm weather and the ephemerals show will be underway. I’m fascinated by words, their sounds, their rhythms, their meanings. By semantics. Mostly I try not to be pedantic about words, but when the subject is “native” plants, I have to be. It’s a word and concept that comes up all the time for us botanerds. Like asking if the newborn baby is a girl or a boy, nativity is where our understanding and appreciation of a plant starts. But why? Why do we care, and what does it really mean, anyway? This map shows wood poppy present somewhere in the state of Maryland (the light green color means that there are no county-level records). 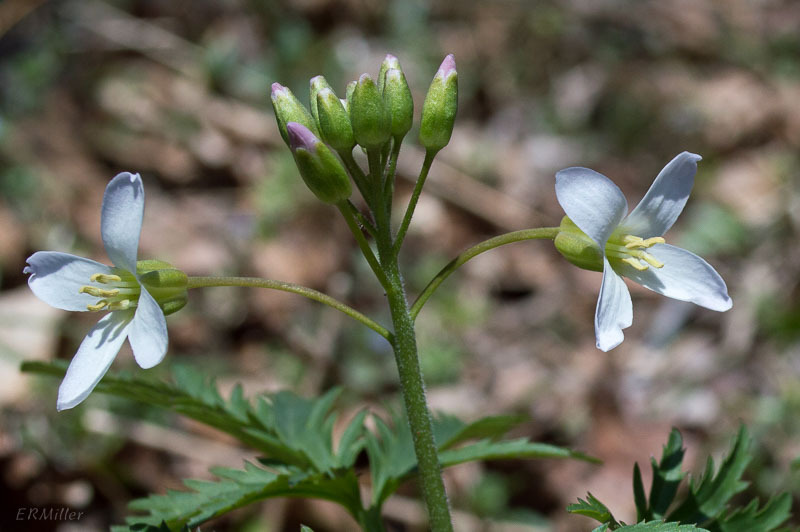 Note that other than in Maryland, there are only two locations east of the Appalachians where wood poppy is present: southeastern Pennsylvania and the District of Columbia. Considering the rest of the distribution, it doesn’t really make sense that there are “naturally occurring” populations of this species outside the mid-west. This is not to say that the USDA PLANTS Database is untrustworthy. It’s an excellent source of good information. My point here is that without the right qualifier, it’s useless to ask if a plant is native. In this example, it’s correct to say that S. diphyllum is native to North America, and it’s correct to say that it’s native to the lower 48 states, but neither of these statements implies that the species is native in every wild place it’s found. Since wood poppy is not native to Maryland, but is found growing wild here, we need a word other than “native” to describe it. “Alien” would be technically correct but that word is loaded with negative connotations. The correct term is naturalized. Getting back to that idea of geographic qualifiers, it’s possible to go a little crazy when you’re trying to decide if something is native. 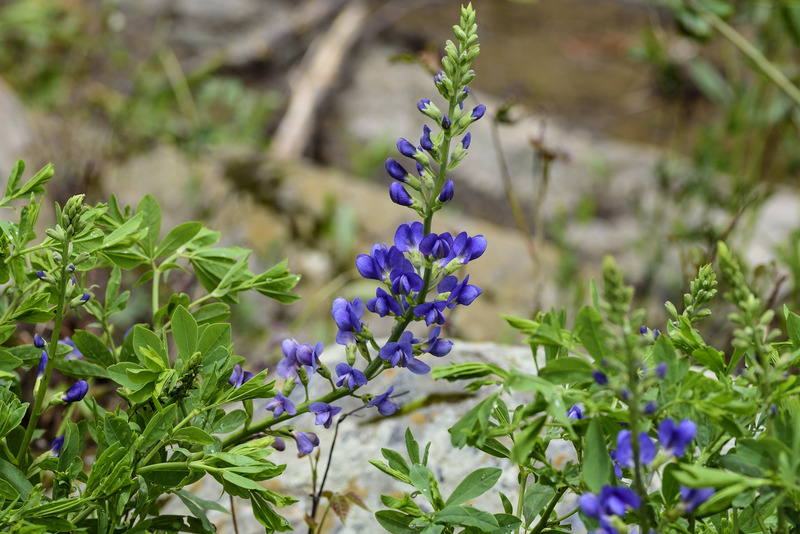 Consider Baptisia australis (wild blue indigo), which has a scattered distribution in the eastern US. In Maryland it is known in only a few locations along the Potomac River, including the Potomac Gorge. So if I were being utterly ecologically correct, I wouldn’t grow it in my garden, because my garden isn’t in the Gorge; it’s about a quarter mile away at a different altitude and on a different underlying rock formation. But that is a ridiculous level of granularity. 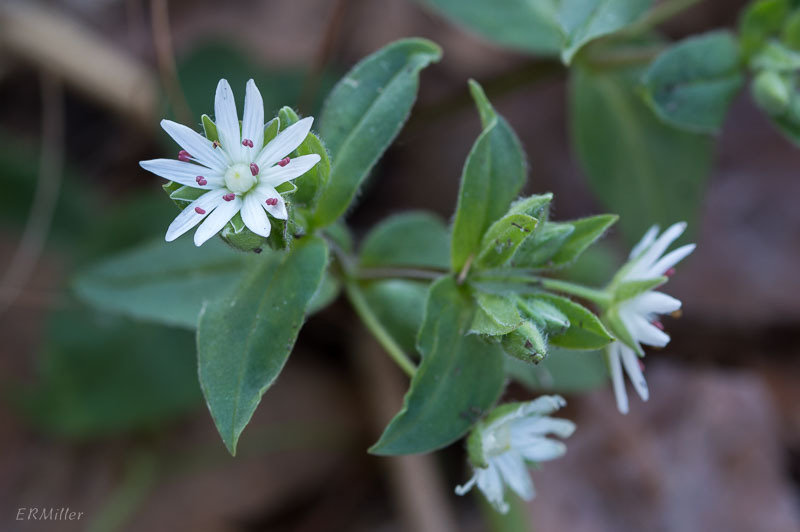 If I’m trying to build a showcase garden of Maryland native wildflowers, should I exclude these two species because the one is naturalized and the other grows only in very specific locations? The answer to that question consider the maxim “first, do no harm.” More on that next time. 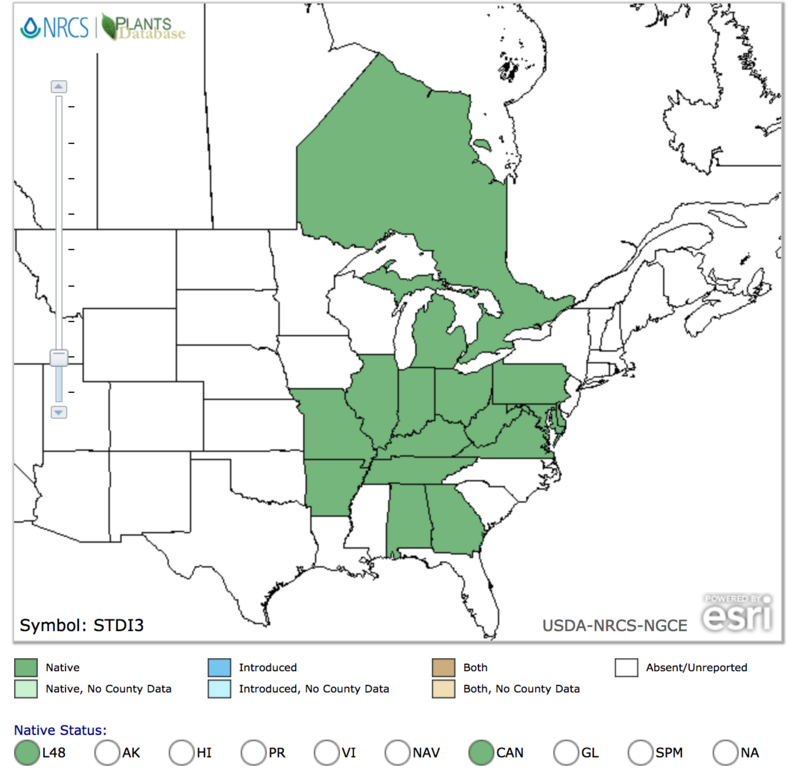 maps from USDA, NRCS. 2018. The PLANTS Database (http://plants.usda.gov, 19 February 2018). National Plant Data Team, Greensboro, NC 27401-4901 USA. It’s March 20, the vernal equinox, and I’m sitting by the woodstove, watching the snow fall. Four to eight inches are predicted by tomorrow night, possibly more, and I just got back from a trip to the Southwest and haven’t been out botanizing at home in about two weeks. 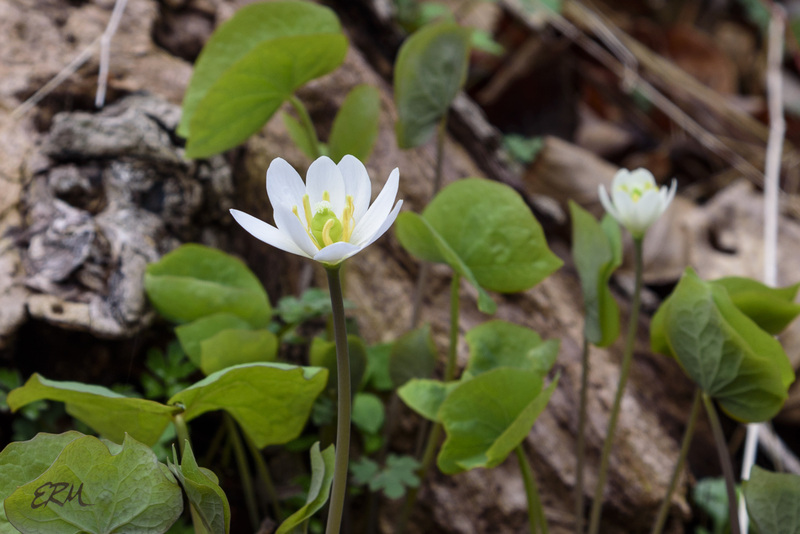 Friends are posting pictures of bloodroot and Dutchman’s breeches that are blooming nearby, but it’ll be a few days before I can go out hunting. look how tiny it is, next to that maple leaf! 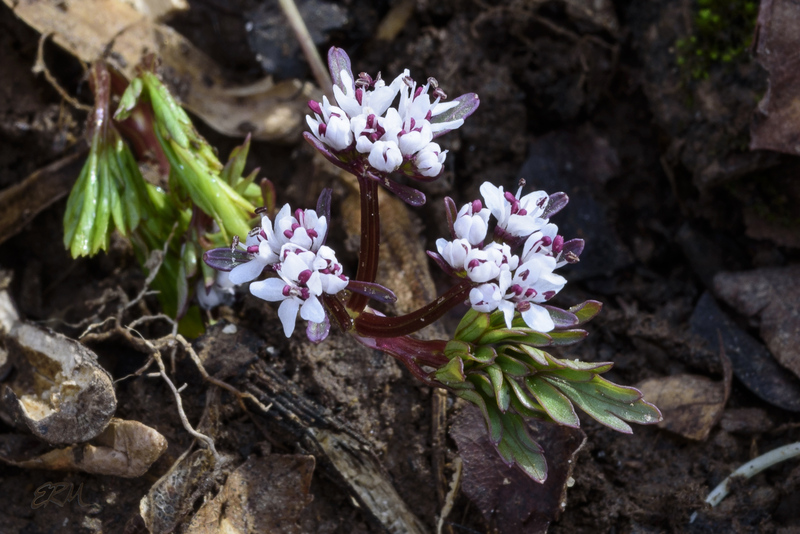 Instead I’m looking at my pictures of Erigenia bulbosa, which, other than skunk cabbage, is the earliest blooming forb in the Maryland piedmont. 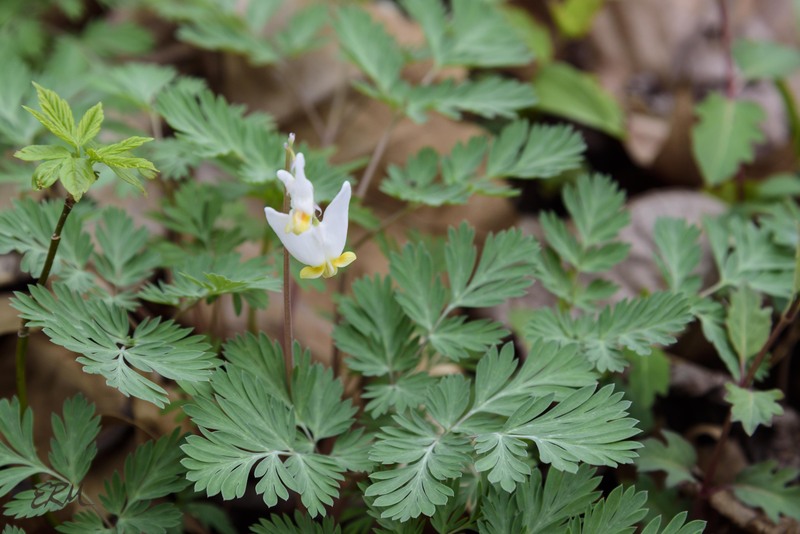 This diminutive perennial plant grows only about 10 centimeters tall, barely poking above the leaves on the forest flower at bloom time. 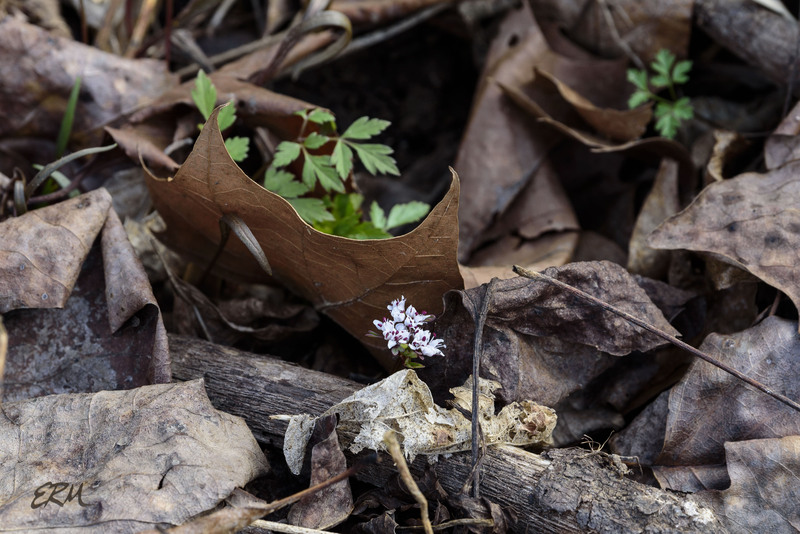 It’s a true ephemeral: after blooming, the finely divided compound leaves open a little further and the plant will grow a little taller, but it dies back before spring is over. The inflorescence is a compound umbel (an umbel of umbels). 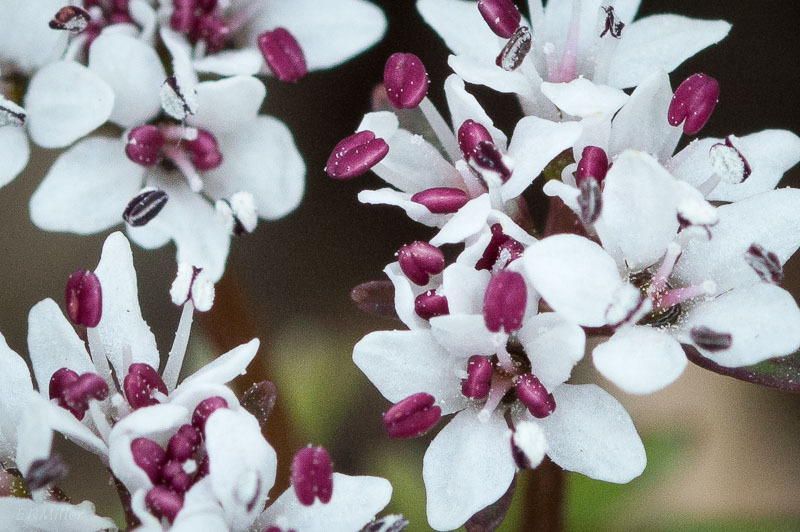 The individual flowers are minute, comprising five white petals and five stamens, whose anthers start red but quickly turn black. 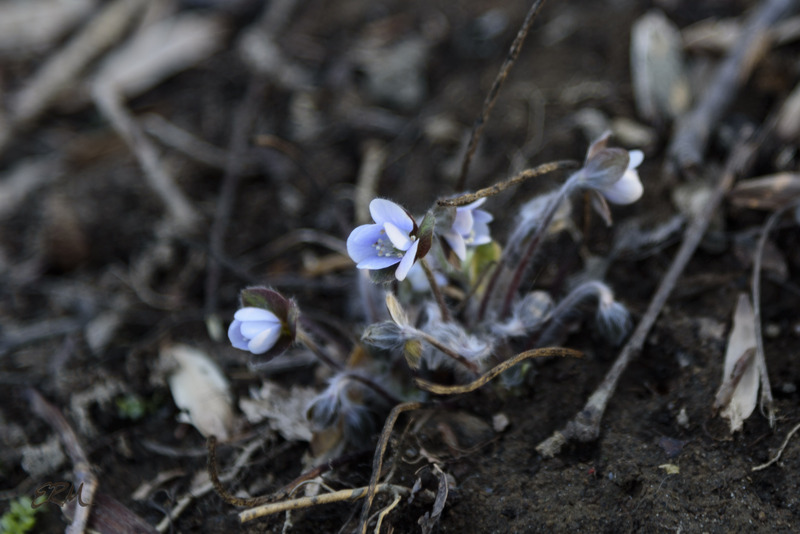 I found these blooming on February 28 this year, which is about as early as I’ve seen it. The blooming period lasts about a month. 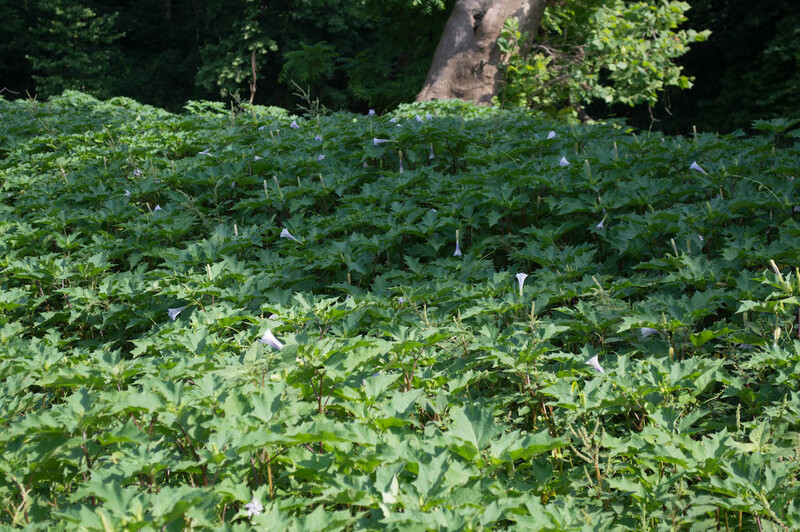 Look for it in rich, moist woodlands, especially near rivers. Erigenia means “born early”; bulbosa is for the (edible) corm from which the plant emerges. Around here it’s called harbinger-of-spring, or sometimes pepper-and-salt (for the anthers and petals); older, less common names include turkey-pea, turkey-foot, and ground-nut1. 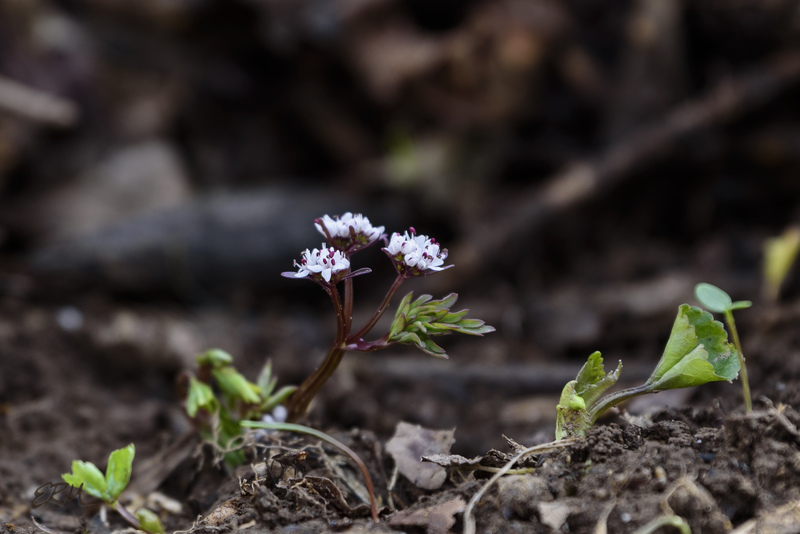 The genus is monotypic (meaning, it only has one species), and this might be the smallest plant in its family (Apiaceae). It’s uncommon in Maryland (listed S3). The Maryland Biodiversity Project has records for it in the counties of Harford, Montgomery, and Washington. There are a few other occurrences of it east of the Appalachians (from northern North Carolina to southern New York), but mostly it’s a plant of the Midwest, where it ranges from central Alabama to central Michigan, and westward into eastern Kansas. 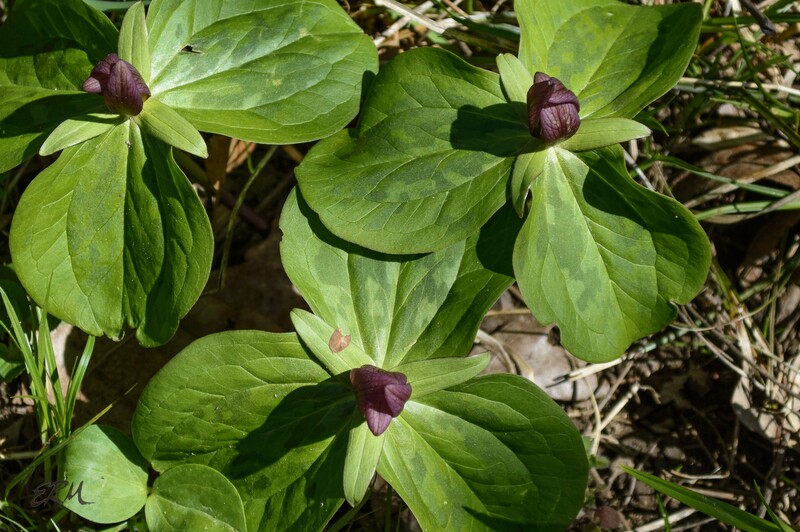 In Wisconsin and New York it’s listed as endangered; in Pennsylvania, it’s threatened. 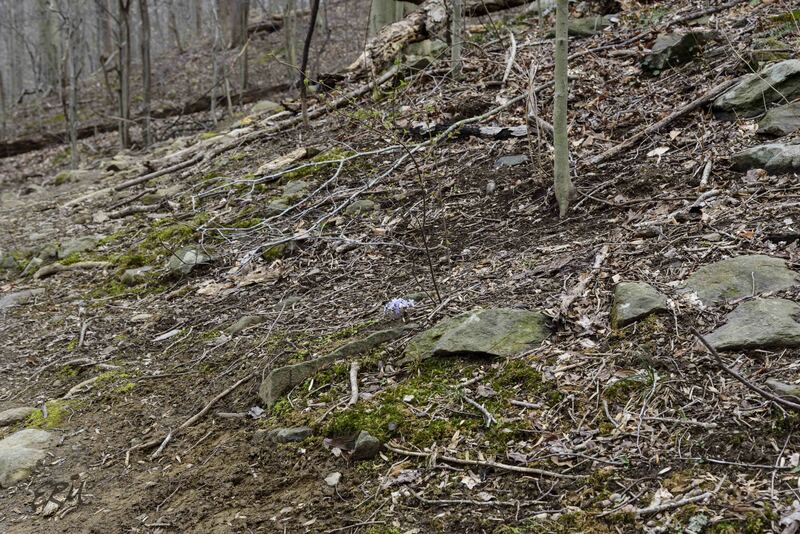 Monday, March 5 – took a quick walk on the Cabin John Trail. 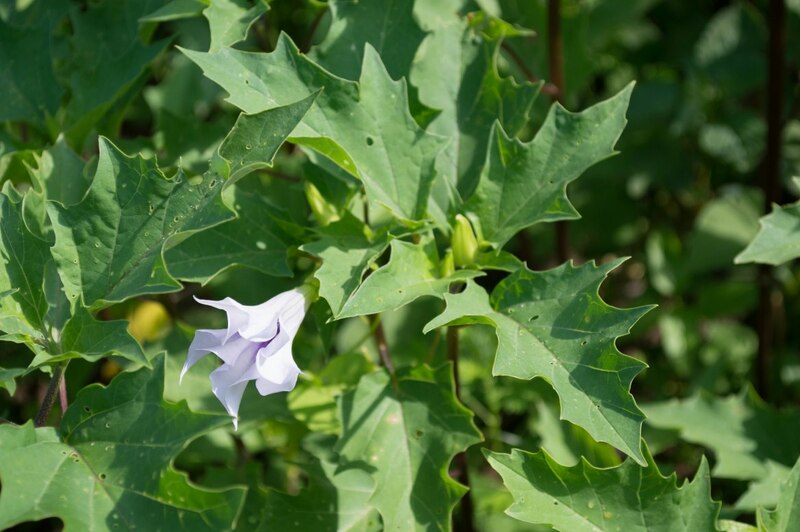 Most of the green forbs were aliens, though the new foliage of a few ephemerals was coming up. 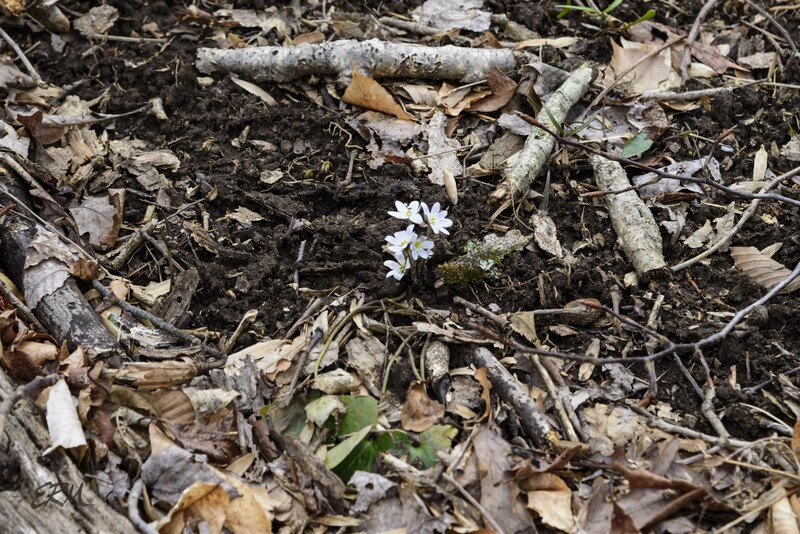 There was one small clump of round-lobe hepatica (Anemone americana; Ranunculaceae) with a few buds opening. 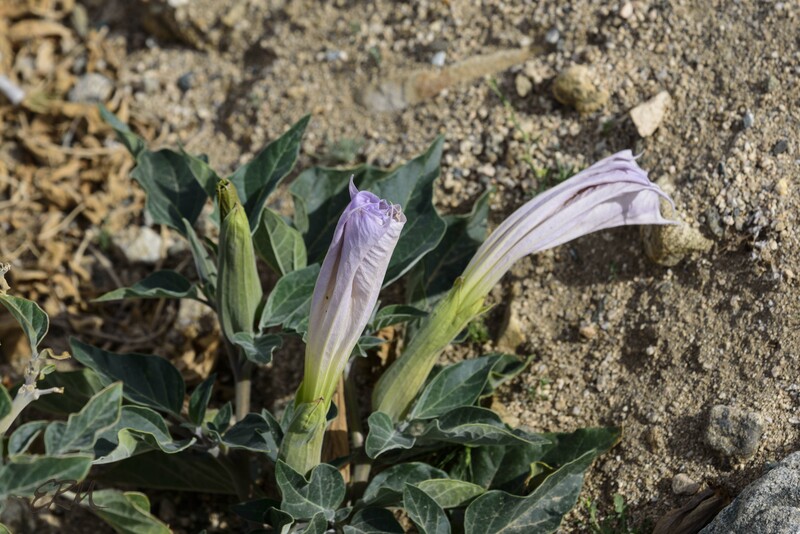 It’s early, but not too early, for this species to be flowering. 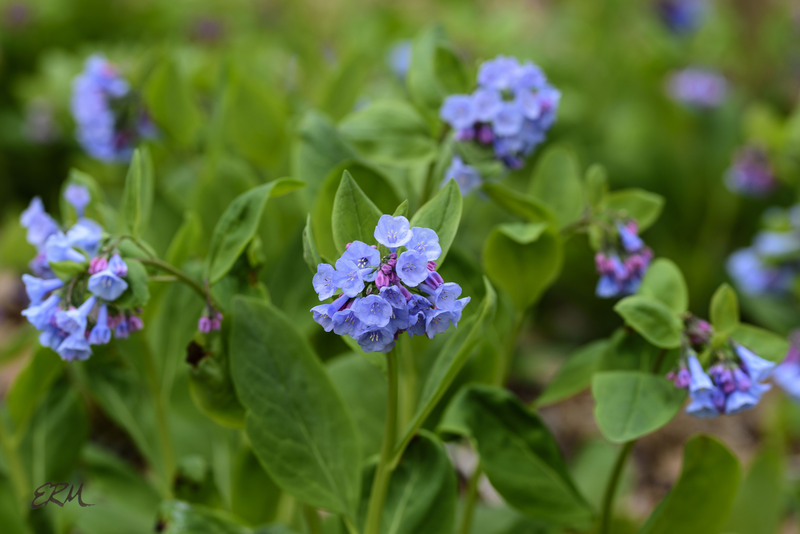 And a few clumps of Virginia bluebells (Mertensia virginica; Boraginaceae), one of which was starting to bloom. 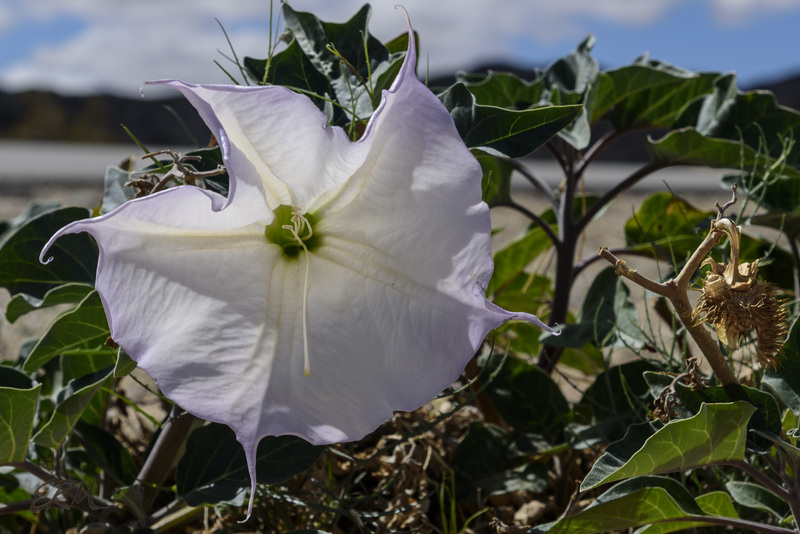 This is quite early, but with the ephemerals I often see one or two blooming on either end of the bell curve. Peak bloom for bluebells is probably at least three weeks away. Odd weather we’ve had this winter. Unusually cold on average, but with unusually warm days. Plants are emerging and budding up and some are blooming already, as I reported in the last post. Anyway, here’s more of what we can look forward to in the next month or so. I usually see these plants in large stands, and all the plants in a stand seem to flower at the same time, but the flowers only last a few days. I’m going to start watching for them in mid-March this year. This is the same species I posted a picture of on Wednesday, with the purple buds. Such a perky thing. The first species in the Asteraceae to bloom ’round here. 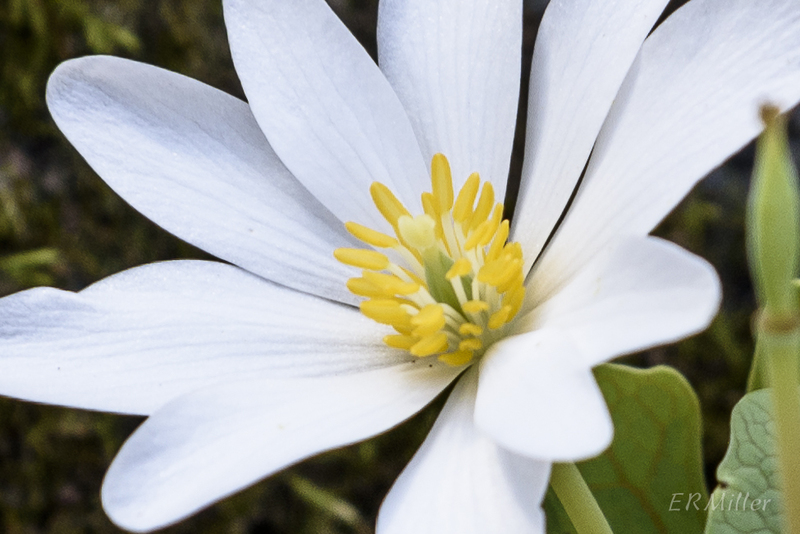 Since bloodroot grows from rhizomes, when there’s more than one plant they’re often in a line. Honestly my love for this plant comes from that common name. This is peak bloom; the flower petals don’t spread open. 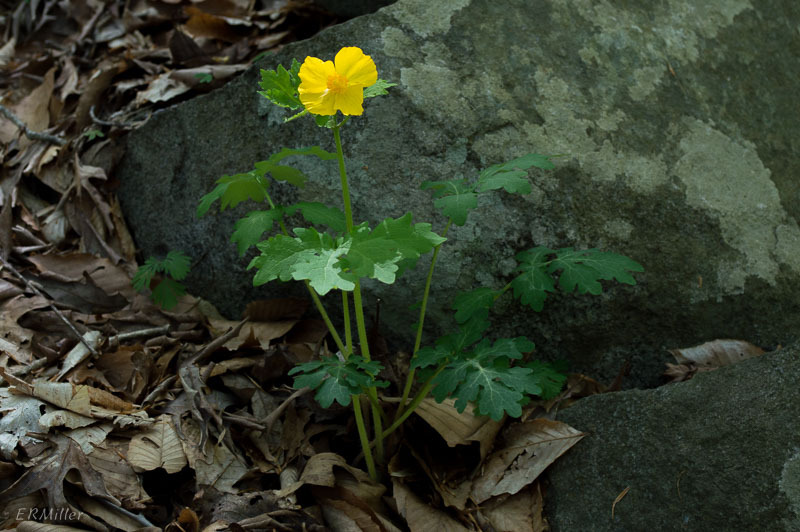 Yellow flowering forms can be found near Carderock. It’s all about those stamens. And fun fact: each flower has five petals. 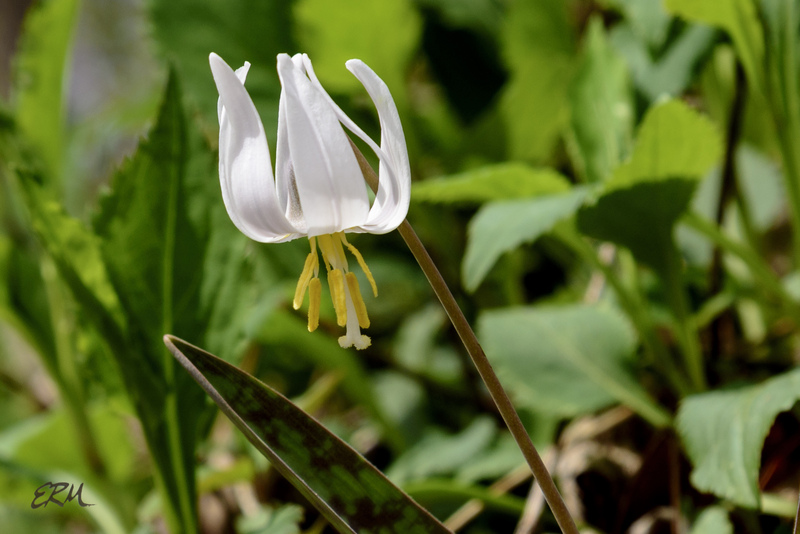 The petals are so deeply cleft that a single petal appears to be two petals. These will be carpeting floodplains and other very moist-soil areas in less than a month. 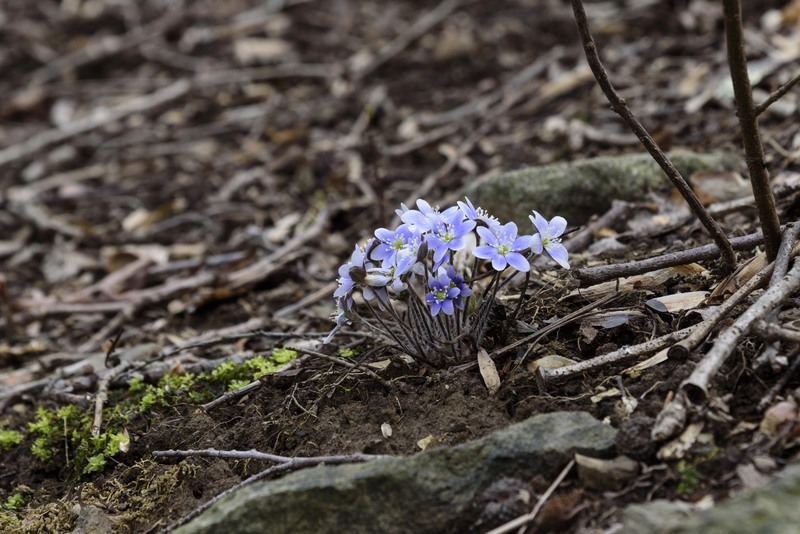 Wild blue phlox starts blooming at about the same time as Virginia bluebells, but they last longer. 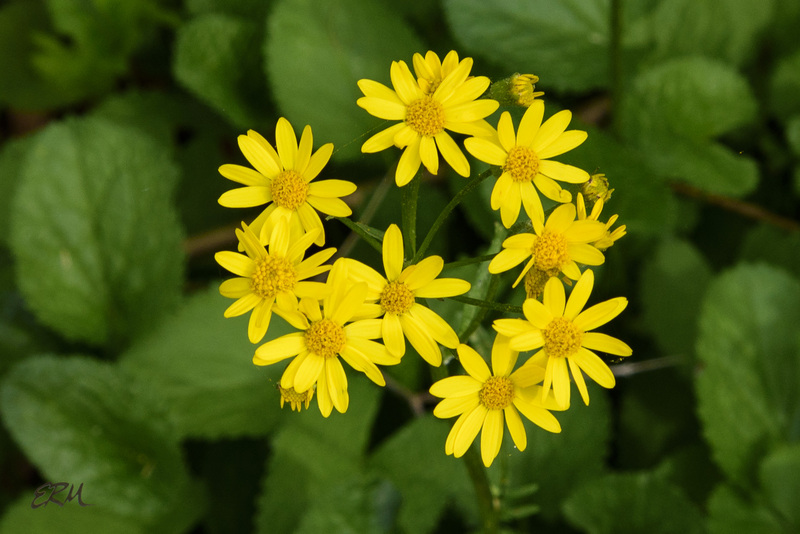 It’s a glorious sight when these two and golden ragwort fill the woods.